CARFAX 1-Owner, Spotless, ONLY 2,003 Miles! FUEL EFFICIENT 24 MPG Hwy/17 MPG City! Agate Black Metallic exterior and Ebony Black interior, XLT trim. 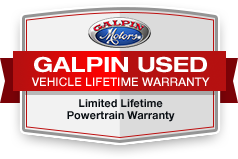 Third Row Seat, Onboard Communications System, iPod/MP3 Input, Smart Device Integration, Keyless Start, Satellite Radio, Rear Air, Aluminum Wheels, Flex Fuel, Back-Up Camera, Serviced here at Galpin, Originally Sold at Galpin, Used Dealer Rental Vehicle.